Thompson, Carol 2018. Philanthrocapitalism: rendering the public domain obsolete?. Third World Quarterly, Vol. 39, Issue. 1, p. 51. McGoey, Linsey and Thiel, Darren 2018. Charismatic violence and the sanctification of the super-rich. Economy and Society, Vol. 47, Issue. 1, p. 111. Phillips, Susan D. 2018. Dancing with giraffes: Why philanthropy matters for public management. Canadian Public Administration, Vol. 61, Issue. 2, p. 151. Allen, Mike. 2015. “Michael Bloomberg: Philanthropy Should ‘Embolden Government.’” Politico Magazine, April 6. Available at www.politico.com/story/2015/04/michael-bloomberg-philanthropy-government-116686 (accessed November 17, 2015). Bachrach, Peter and Baratz, Morton S.. 1962. “Two Faces of Power.” American Political Science Review 56 (4): 947–52. Barkan, Joanne. 2011. “Got Dough? How Billionaires Rule Our Schools.” Dissent, Winter. Available at www.dissentmagazine.org/article/got-dough-how-billionaires-rule-our-schools (accessed November 17, 2015). Bartels, Larry. 2010. Unequal Democracy: The Political Economy of the New Gilded Age. Princeton, NJ: Princeton University Press. Beinart, Peter. 2014. “Mega Donors Are Now More Important Than Most Politicians.” The Atlantic, April. Available at www.theatlantic.com/politics/archive/2014/04/mega-donors-are-now-more-important-than-most-politicians/360192/ (accessed November 14, 2015). Beresford, Susan. 2007. “Diversity the Strength of U.S. Giving.” Seattle Post-Intelligencer, April 27, B7. Bishop, Matthew and Green, Michael. 2008. Philanthrocapitalism. New York: Bloomsbury. Bishop, Matthew and Green, Michael. 2015. “Philanthrocapitalism Rising.” Society 52 (6): 541–8. Burns, Alexander and Haberman, Maggie. 2013. “2013: Year of the Liberal Billionaire.” Politico Magazine, November 1. Available at www.politico.com/story/2013/11/liberal-billionaires-fundraising-2013-elections-tom-steyer-mark-zuckerberg-michael-bloomberg-099207 (accessed November 17, 2015). Bustillos, Maria. 2012. “Our Billionaire Philanthropists.” The Awl, June 13. Available at www.theawl.com/2012/06/our-billionaire-philanthropists (accessed November 18, 2015). Callahan, David. 2014. “Mark Zuckerberg’s $2.5 Billion Foundation.” Inside Philanthropy. Available at www.insidephilanthropy.com/home/2014/7/25/mark-zuckerbergs-25-billion-foundation.html (accessed November 17, 2015). Carnes, Nicholas. 2013. White-Collar Government. Chicago: University of Chicago Press. Coffey, Brendan. 2015. “Pledge Aside, Dead Billionaires Don’t Have to Give Away Half Their Fortune.” Bloomberg Business, June 4. Available at www.bloomberg.com/news/articles/2015-06-04/as-billionaires-bask-in-glow-of-pledge-giving-half-is-optional (accessed November 18, 2015). DiMento, Maria. 2012. “Charitable Giving Dwarfs Political Donations by America’s Most-Generous Philanthropists.” The Chronicle of Philanthropy, October 14. Available at https://philanthropy.com/article/Big-Donors-Philanthropy/155973 (accessed November 17, 2015). Edwards, Michael. 2011. “Impact, Accountability, and Philanthrocapitalism.” Society 48: 389–90. Eikenberry, Angela M. 2006. “Philanthropy and Governance.” Administrative Theory & Praxis 28 (4): 586–92. Fleishman, Joel L. 2007. The Foundation: A Great American Secret. New York: Public Affairs. Freeland, Chrystia. 2012. Plutocrats. New York: Penguin. Freeland, Chrystia. 2013. “Plutocrats vs. Populists.” New York Times, November 1. Available at www.nytimes.com/2013/11/03/opinion/sunday/plutocrats-vs-populists.html?_r=0 (accessed November 17, 2015). Frumkin, Peter. 2006. Strategic Giving: The Art and Science of Philanthropy. Chicago: University of Chicago Press. Gilens, Martin and Page, Benjamin. 2014. “Testing Theories of American Politics: Elites, Interest Groups, and Average Citizens.” Perspectives on Politics 12 (3): 564–81. Goldenberg, Suzanne. 2013. “Billionaires Secretly Funded Vast Climate Denial Network.” Mother Jones, February 15. Available at www.motherjones.com/politics/2013/02/donors-trust-climate-denial (accessed November 17, 2015). Hacker, Jacob S. and Pierson, Paul. 2011. Winner-Take-All Politics. New York: Simon & Schuster. Harvey, Charles, Maclean, Mairi, Gordon, Jillian, and Shaw, Eleanor. 2011. “Andrew Carnegie and the Foundations of Contemporary Philanthropy.” Business History 53 (3): 425–50. Herbert, Bob. 2014. “The Plot Against Public Education: How Millionaires and Billionaires Are Ruining Our Schools.” Politico Magazine, October 6. Available at www.politico.com/magazine/story/2014/10/the-plot-against-public-education-111630 (accessed November 17, 2015). Jenkins, Garry W. 2010–2011. “Who’s Afraid of Philanthrocapitalism?” Case Western Reserve Law Review 61:753. Jenkins, J. Craig. 1998. “Channeling Social Protest: Foundation Patronage of Contemporary Social Movements.” In Private Action and the Public Good, ed. Powell, Walter W. and Clemens, Elisabeth S., 206–16. New Haven, CT: Yale University Press. Katz, Stanley N. 2012. “Beware Big Donors.” The Chronicle Review/The Chronicle of Higher Education, March 25. Available at http://chronicle.com/article/Big-Philanthropys-Role-in/131275 (accessed April 14, 2016). Kroll, Andy and Schulman, Daniel. 2014. “The Koch Brothers Left a Confidential Document at Their Donor Conference.” Mother Jones, May 5. Available at www.motherjones.com/politics/2014/02/koch-brothers-palm-springs-donor-list (accessed November 17, 2015). Kumashiro, Kevin K. 2012. “When Billionaires Become Educational Experts.” Academe, May–June. Available at www.aaup.org/article/when-billionaires-become-educational-experts#.VkucEIRN10s (accessed November 17, 2015). LaMarche, Gara. 2014. “Democracy and the Donor Class.” Democracy: A Journal of Ideas 34 (Fall). 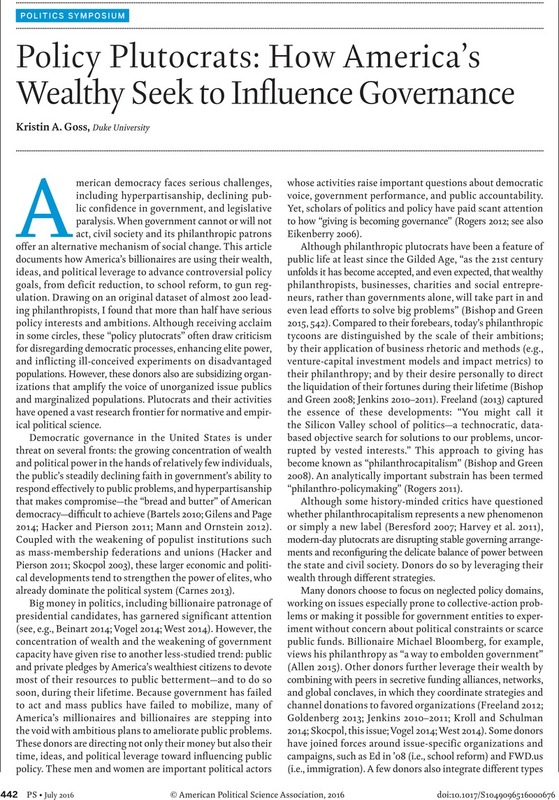 Available at www.democracyjournal.org/34/democracy-and-the-donor-class.php?page=all (accessed November 18, 2015). Mann, Thomas E. and Ornstein, Norman J.. 2012. It’s Even Worse than It Looks. New York: Basic Books. Miller, Claire Cain. 2013. “Laurene Powell Jobs and Anonymous Giving in Silicon Valley.” New York Times, May 24. Available at http://bits.blogs.nytimes.com/2013/05/24/laurene-powell-jobs-and-anonymous-giving-in-silicon-valley/?_r=2 (accessed November 17, 2015). OpenSecrets. 2015a. “Outside Spending.” Available at www.opensecrets.org/outsidespending (accessed November 17, 2015). OpenSecrets. 2015b. “2014 Top Donors to Outside Spending Groups.” Available at www.opensecrets.org/outsidespending/summ.php?cycle=2014&disp=D&type=V&superonly=N (accessed November 18, 2015). OpenSecrets. 2015c. “2012 Top Donors to Outside Spending Groups.” Available at www.opensecrets.org/outsidespending/summ.php?cycle=2012&disp=D&type=V&superonly=N (accessed November 18, 2015). Reckhow, Sarah. 2016. “More than Patrons: How Foundations Fuel Policy Change and Backlash.” PS: Political Science and Politics 49 (3): this issue. Roelofs, Joan. 2003. Foundations and Public Policy: The Mask of Pluralism. Albany: State University of New York Press. Rogers, Robin. 2011. “Why Philanthro-Policymaking Matters.” Society 48 (5): 376–81. Rogers, Robin. 2012. “The Hidden Dangers of Million-Dollar Donations.” The Washington Post, January 1, B3. Rogers, Robin. 2015. “Why the Social Sciences Should Take Philanthropy Seriously.” Society 52 (6): 533–40. Salamon, Lester M. 2014. Leverage for Good. New York: Oxford University Press. Skocpol, Theda. 2003. Diminished Democracy. Norman: University of Oklahoma Press. Skocpol, Theda and Williamson, Vanessa. 2012. The Tea Party and the Remaking of Republican Conservatism. New York: Oxford University Press. Stanley, Alessandra. 2015. “Silicon Valley’s New Philanthropy.” New York Times, October 31. Available at www.nytimes.com/2015/11/01/opinion/siliconvalleys-new-philanthropy.html?_r=0 (accessed November 18, 2015). Vogel, Kenneth P. 2014. Big Money. New York: Public Affairs. Walker, Jack L. 1991. Mobilizing Interest Groups in America. Ann Arbor: University of Michigan Press. West, Darrell. 2014. Billionaires: Reflections on the Upper Crust. Washington, DC: The Brookings Institution Press.